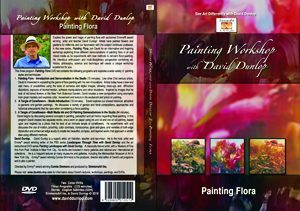 Painting Flora with David Dunlop – NEW DVD and ONLINE WORKSHOP! Explore the power and magic of painting flora with Emmy® award winning acclaimed artist and teacher David Dunlop. Artists have painted flowers and gardens for millennia and our fascination with the subject continues unabated. In this new series, Painting Flora, join David for an informative and inspiring workshop exploring three different demonstrations of painting flora in oil and mixed media as he experiments with new methods to reinvent floral painting. His infectious enthusiasm and multi-disciplinary perspective combining art, history, philosophy, science and technique creates provide a unique workshop experience for you. 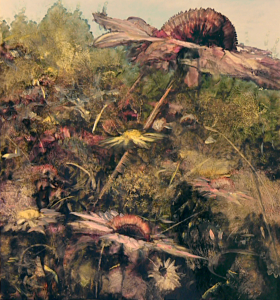 Program 1 – Painting Flora – Introduction and Demonstration in the Studio (72 minute program). Like other 21st century artists, David is interested in expanding the genre of flora painting with his own innovations. Artists today have a new and vast menu of possibilities using the tools of cameras and digital images, allowing close-ups and diffraction distortions, captures of blurred motion, software manipulations and other mutations. 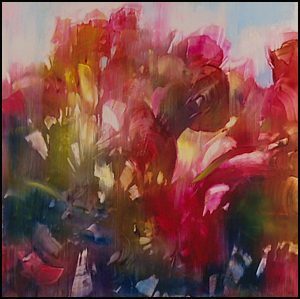 Inspired by images that he took of red-toned flowers at the New York Botanical Garden, David creates a new composition using examples from great masters and explores color, movement and texture in his exuberant and lyrical oil painting. 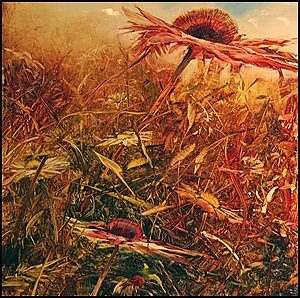 Program 2 – A Tangle of Coneflowers – Studio Introduction (18 minutes). David explores our shared historical attraction to gardens and garden paintings. He discusses a variety of garden and floral compositions, approaches and historical antecedents that he uses when considering a floral painting. Program 3 – A Tangle of Coneflowers –Multi Media Ink and Oil Painting Demonstrations in the Studio (84 minutes). David begins by discussing several concepts in painting, perception and art history regarding floral painting. In this program David creates two separate works, one a work on paper using ink and oil and one an oil painting, based upon and inspired by a photo that he took of an intricate tangle of coneflowers. He experiments with and discusses the use of motion, proximity, color contrasts, translucence, glow and glare, and varieties of both edge dissolution and enhanced edge acuity to create two beautiful, complex, and layered works that approach a similar idea using different methods. David Dunlop. David Dunlop is a superb artist, art historian, teacher and raconteur. He is the host, artist and Emmy® award winning writer of the PBS series Landscapes Through Time with David Dunlop and other art instructional DVD series. A classically trained artist, with a Masters of Fine Arts from Pratt Institute in New York City, his works are included in many galleries and national and international art collections. He is a frequent lecturer at many museums and galleries, including the Metropolitan Museum of Art in New York City. Directed by Emmy® award winning Connie Simmons and produced by SimmonsArt Inc.